Being a Mother is honestly on of my biggest blessings. I am amazed at how our little people are growing and changing every day. But the cool thing about being a Mom is realizing that I am growing and changing everyday too! Not much about being a Momis easy, and not a day goes by that i don't find myself wondering if I am doing a good job. Then the miraculous happens, I walk by an open door or over hear one of my kids saying something they appreciate about me and I go to pieces. Raising Godly kids who have a heart for people is the goal my hubby and I have...but we are so grateful that this is a marathon and not a sprint. I try to remember Psalms 121:1 and know that my help in Motherhood, and in life comes from the Lord. So, since Mother's Day is right around the corner, I wanted to help the munchkins and the Dad's make something that will be easy, delicious, and keep Mom healthy. These are two recipes that are sure to please. I love making these delicious dishes. The fritatta is a classic, and its basically a one-pot wonder. The soup is a nice treat for the cool, rainy days when it feels more like fall. Whatever the weather on Mother's Day, the effort of making something especially to treat her and keep her healthy, will be appreciated. Cheers to all the Mom's! I celebrate with you today! In a medium sautee pan, sautee shallots, and garlic in coconut oil until translucent. Remove from heat. 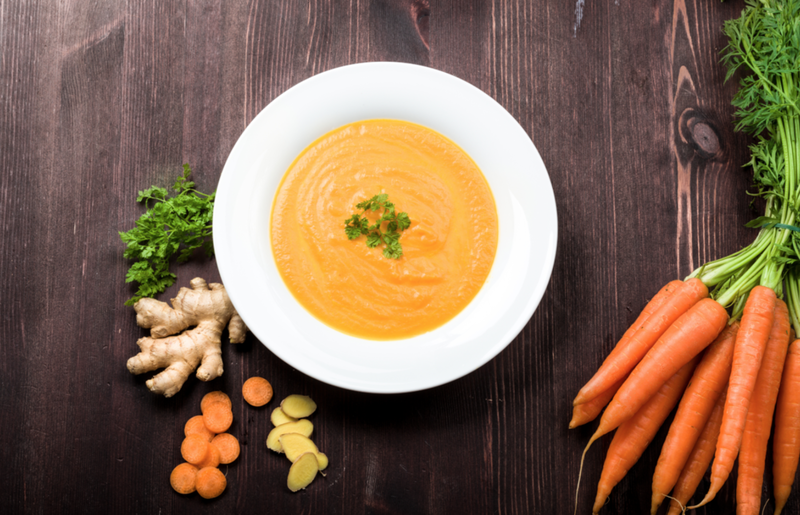 Place carrots, and water in high powered blender and blend on high until pureed. Pour carrot puree, into pot, on medium heat. Continue by adding sauteed vegetables, herbs and spices. Grate peeled ginger into the soup mixture. finish by adding 1 can of full fat coconut milk to thicken. Cook about 8-10 minutes on medium-low heat. Adjust seasoning to taste with salt and pepper and serve. 1 cup Leeks, washed and pat dry. Add 1 tablespoon of olive oil to a 10-inch cast iron or other heat proof skillet over medium high heat. Add potatoes and cook for 5 minutes, stirring periodically, allowing them to develop a crust. Lower heat to medium, cover, stirring occasionally until the potatoes are fairly soft; 5-10 minutes. Remove and set aside. While potatoes are cooking, in a large mixing bowl whisk the eggs together. Add in thyme, salt, pepper and Gruyere cheese; whisk to combine. Set aside. Heat the second tablespoon of olive oil over medium-high heat in the skillet. Add the leeks and cook for 4 minutes, stirring constantly. Add the asparagus and cook for an additional 6 minutes, stirring often. Return the potatoes to the skilled and stir to combine. Spread the vegetables and potato mixture to evenly cover the bottom of the skillet. Pour the egg mixture evenly over the vegetables in the skillet. Allow the frittata to cook undisturbed until the edges are set; 2-4 minutes. Place the frittata in the heated oven and allow it to finish cooking for 10-12 minutes until the liquid is gone and the top is fluffy. Add the Havarti cheese and continue to cook 1-2 minutes until it had melted. I hope you all enjoy these recipes, and share pictures of the happy Mom's in your life.